Are you wondering how to get your business ready for Web 3.0? I recently did a speech on this topic for the Web SIG Cleveland. August is recycle your computer month, however Dan Hanson’s Computers Assisting People (CAP) is on a continual mission to enable those who are need of technology. CAP strives to provide a complete solution (not just recycling) so that recipients will really be empowered by the technology and be able to improve the quality of lives. I was talking with my brother and his wife the other night about getting out and discovering the city. There are many resources right at your fingertips and with a little bit of cash, you can actually go a long way. How you may ask? Have you discovered your local independent restaurant gift certificate auction? If you live in Birmingham, Cleveland, Chicago, Cincinnati, Columbus, Kansas City, Louisville, Madison, Mt. Washington, Valley, NH, Naples, Nashville, Sarasota, Manatee or Tucson you can take advantage of half-off gift certificates. You can purchase $50 gift certificates for $35 and $25 gift certificates for $15 dollars. The auctions occur at announced times through the year and the best way to stay in the loop is to sign-up for their newsletter. Note: In Cleveland, the collective of local eateries is called the Cleveland Independents and they use Eat Like A Local network to process the transaction, however I didn’t see it listed on Eat Like A Local’s homepage. I’ve used this service and love it, have you? On the web, most people these days start at a search engine to begin their quest for information. The standard model for search is Google; you type a term into a search box and then you must sort page by page for your results. 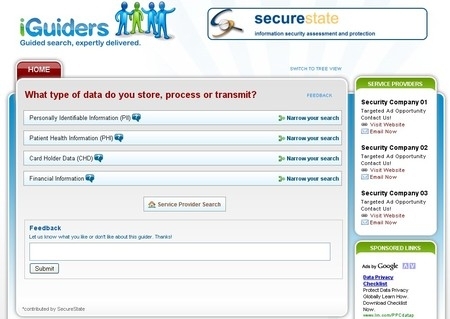 Now iGuiders, a local Cleveland area start-up, has a streamlined way of performing an Internet search. I like to think of iGuiders as more of a hand-holding approach to search or tree building way to get to results. You select from a preselected group of categories. Right now the “beta” site has limited categories, but try it out for yourself and tell us what you think? A month ago I created an ever growing list of social networking websites and there was one that recently jumped out at me. I wanted to find a new restaurant to fine dine. I checked out Cleveland Eats first, then I wandered over to Yelp. Yelp has reviews on everything from restaurants, shopping, nightlife, spas, coffee shops and just places to go. Find out what people are saying out about the establishments in your town. The site currently features 200+ reviews of local restaurants. It also has reviews of unique places to go like catching an Indie film at the Cinematheque. Yelp is great way to discover your city. The other day I went out to dinner and the way out of the restaurant I noticed an empty Plain Dealer newspaper dispenser. 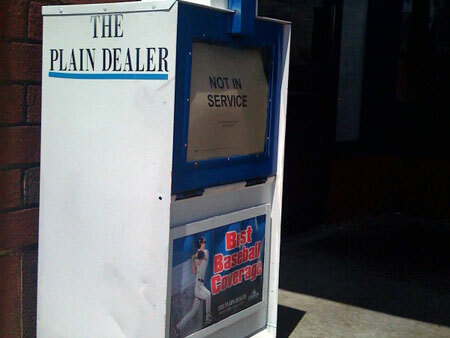 As I walked about Cleveland, I noticed that every PD newspaper pay-as-you-go curbside unit said “Not In Service”. Being curious I called the Plain Dealer subscription department and the representative stated that their focus is home delivery these days and every other delivery method wasn’t cost effective. As a matter of fact, the size of weekend edition of the Plain Dealer recently shrank, however the cost of delivery increased. To further increase the drama, the Cleveland Free Times recently was purchased by The Scene, a nationally syndicated magazine, which further dwindles your news choices. Could traditional newspaper delivery be reaching the end? You can now get all your news on the iPhone by downloading a free news application. Do you still buy the daily newspaper? Will you continue to purchase the local news if the cost continues to increase? 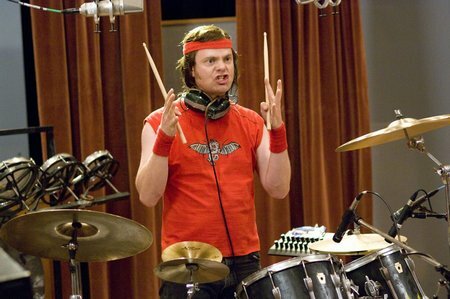 The other day I saw a sneak preview of the new comedy “The Rocker” starring Rainn Wilson. You may know Rainn as Dwight on TV’s “The Office”. I would describe the movie as a cross between Wayne’s World and School of Rock. I went into the movie not expecting much and I was pleasantly surprised. The premise, a washed-up 1980s rock band drummer aka Robert “Fish” Fishman gets another chance at making it big. The movie believe it or not has good interaction between all characters; I actually laughed from beginning to end. Rainn Wilson and Christina Applegate especially had notable performances. If you are a Clevelander, you will be also thrilled that “C” town is featured at every turn in the movie. The movie is rated PG-13 rightfully so with some crude language and humor. I would recommend seeing “The Rocker” because it’s funny and has a good message to follow your dreams.